So with no spending on Iraq, Afghanistan or Social Security (as well as no fix of the alternative minimum tax, I assume), the deficit still isn't cut in half by 2009. But we're on track! 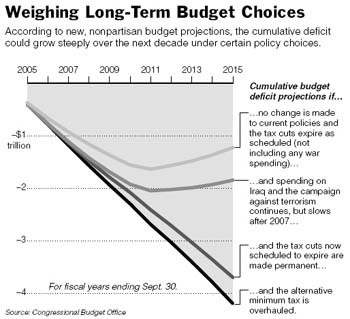 PS There's a great graph in the New York Times print version today illustrating how much different our long-term fiscal trajectory looks in the CBO numbers when you add in costs for Iraq, Afghanistan and making the tax cuts permanent. But it's not online for some reason. I'll try to scan it in later. As Krugman points out, the Journal fails to disclose that its chart is based on two implausible assumptions that CBO is required to make -- first, that Bush's tax cuts expire in 2010 and second, that nothing is done to reform the alternative minimum tax (though the editors acknowledge that the chart also excludes costs for Iraq and Afghanistan). If the tax cuts are made permanent and the AMT is fixed, things get a whole lot worse, as in the previous graph. Don't trust the Journal op-ed page!